This book deconstructs the story of liberalism that John Rawls, author of Political Liberalism, and many others have put forward. Peter L.P. Simpson argues that political liberalism is despotic because it denies to politics a concern with the comprehensive human good; political illiberalism overcomes this despotism and restores genuine freedom. 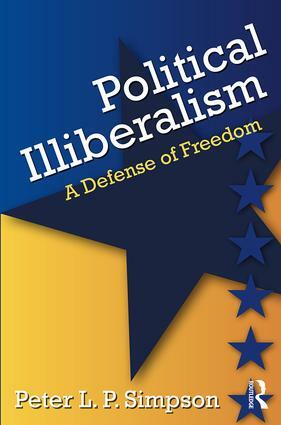 In Political Illiberalism, Simpson provides a detailed account of these political phenomena and presents a political theory opposed to that of Rawls and other proponents of modern liberalism. Simpson analyses and confronts the assumptions of this liberalism by challenging its view of liberty and especially its cornerstone that politics should not be about the comprehensive good. He presents the fundamentals of the idea of a truer liberalism as derived from human nature, with particular attention to the role and power of religion, using the political thought of Aristotle, the founding fathers of the United States, thinkers of the Roman Empire, and contemporary practice. Political Illiberalism concludes with reflections on morals in the political context of the comprehensive good. Simpson views the modern state as despotically authoritarian; consequently, seeking liberty within it is illusory. Human politics requires devolution of authority to local communities, on the one hand, and a proper distinction between spiritual and temporal powers, on the other. This thought-provoking work is essential for all political scientists and philosophy scholars.